If you're unfamiliar with the nonprofit Triad Local First in Greensboro, I'm here to tell you that the group is doing some very exciting stuff. The organization is a network of locally owned and independent businesses in the Triad, committed to building a strong, local economy and a vibrant community (which I think is important to all of us these days.) Each year, TLF's Community Table fundraiser dinner brings together people who want to advance the organization's mission, all the while having some pretty spectacular locally-sourced food. This year's Community Table was at Hidden Lane Farm in Summerfield, which could not have been a more beautiful location for this event. It was incredibly inspiring to see so many people come together for a good cause, and one they are passionate about. I got chills hearing Executive Chef Travis Myers and 2015's Executive Chef Tim Thompson speak about the impact this organization has on the community, and it's a great reminder that we should continue to bridge the gaps between Winston-GSO-High Point, to make the Triad thrive. The caliber of chefs that showed up for this was top-notch: Chefs Richard Miller (Graze), John Bobby (A Noble Grille), Jared Keiper (The Tavern in Old Salem), James Patterson (Sedgefield Country Club), Janis Karathanas (Providence Restaurant), the aforementioned Tim Thompson (Greensboro Country Club) and Travis Myers (Willow's Bistro), among many others. Needless to say, the food was sensational. 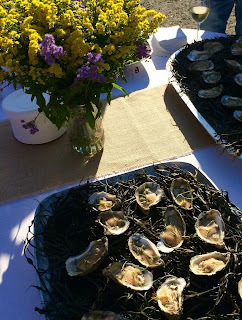 When I arrived, I was greeted with Grilled Oysters with Tomato Foam, and spotted a huge dish of Paella cooking away. It's not everyday you find legit paella in this hemisphere! 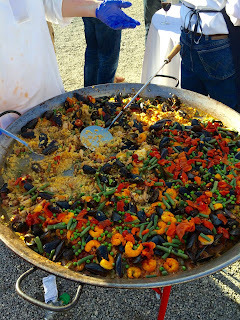 It was studded with mussels, shrimp, chicken and sausage, with a savory saffron sauce. I loaded up on it. TOPO Organic Spirits was in the mix, offering up 3 cocktails featuring their whiskey, vodka and my favorite: gin. The Spicy Cucumber Lemonade had a bright and spicy earthiness - I had 2! Beer lovers got to sample Pig Pounder Brewery, while winos tasted some selections from Zeto. They also provided the wine for the evening - a slightly sweet Vouvray and a tasty red Zin. With a belly full of gin and paella, I didn't know how to begin pacing myself for the start of 9 courses. But try I must, because I had been watching a giant kettle of Brunswick Stew cook over a fire since I arrived. This wasn't your average Brunswick Stew, either. It had rabbit, pork, butter beans, corn and OKRA! It was slighly sweet, and a perfect consistency. The pacing of the evening was perfect. Not long after the stew, a colorful dish of Panzanella appeared, family-style. Heirloom Tomatoes, Pea Shoots, Olives, Peppers and Charred Bread were nestled together in a tangy vinaigrette. This is the epitome of a summer dish. Heck, it's a great dish anytime of the year. For the record, there is no wrong way to eat lamb. But when it is pit-cooked, it is especially delicious. The rosemary mop (sauce) and hoppin' John that accompanied it made for a really beautiful balance of flavors. I was worried the rosemary would overpower the natural flavor of the lamb, but it brought out earthy, almost floral notes in the meat. 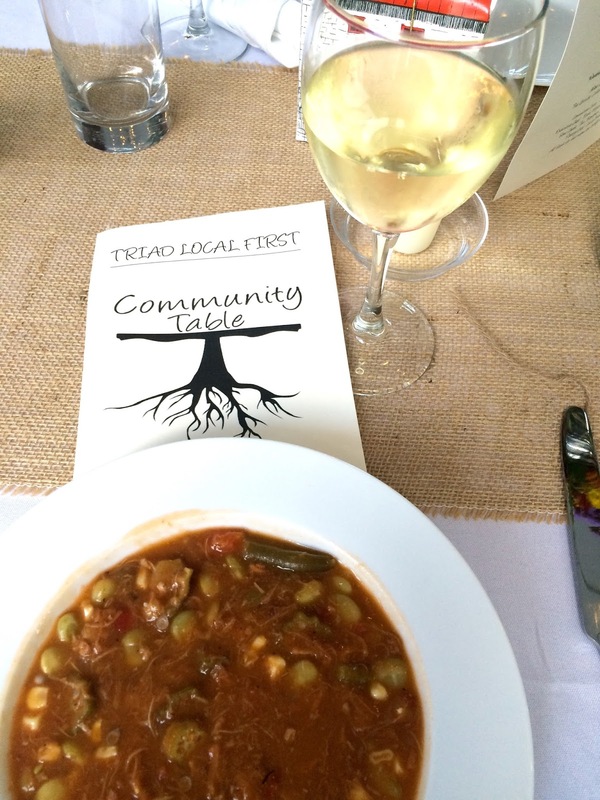 To highlight some of our local vegetables, we had an Heirloom Tomato and Flat Bean Salad, served family-style. Ripe tomatoes, haricot verts and wax beans were drizzled with olive oil, sprinkled with scallion ash, with tangy wedges of Goat Lady Dairy Goat Cheese. The cheese could have easily been the star of the show, but the freshness of the vegetables and difference in textures made for a really delightful dish. Heritage Farms Lexington-Style Pit Cooked Hog paid homage to the amazing, vinegary pulled pork we all love here in the South. Notes of wood and smoke remind you that the chefs had been putting some TLC into this one all day. 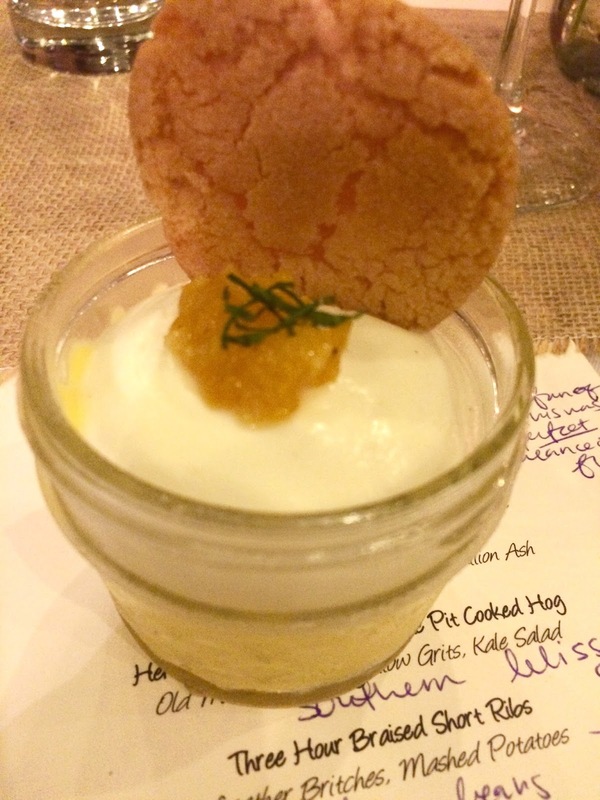 Old Mill of Guilford's creamy yellow grits were a perfect accompaniment and absorbed the flavors of the pork. Shredded kale rounded out the plate, and I found them comparable to collards. The slight bitterness helped break up the richness of the dish. This is Southern bliss on a plate. Course #8 of 9 was naturally one of the most decadent. 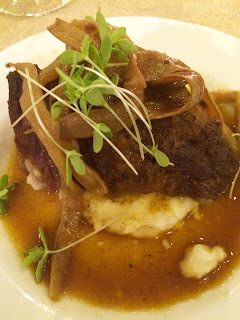 Three hour braised Short Ribs had a savory umami flavor that was impossible to resist. Just when I thought I couldn't eat another bite, this tender meat literally crumbled under my fork. The mashed potatoes were not just a side either; they were a perfect vessel for the jus and leather britches (dried green beans). I didn't think I was going to make it through another meat course, but I did. And I'm so glad I didn't look back. I have grown to love a good dessert wine, so when a Muscat (much like a Moscato) was offered alongside the Orange Creamsicle Mousse Cake, I was tickled. The wine on its own is incredibly sweet; with the dessert, oddly enough, it cut through the sweetness of the dish. The star of the dessert was the brown butter vanilla shortbread cookie adorning the top of the mini mason jar. Citrus was a perfect way to end this meal, and a charred citrus confit helped cap off this amazing Southern - soul food - pig pickin' dinner. Tickets to Community Table sell out each year, so you'll want to have this on your radar for 2017. 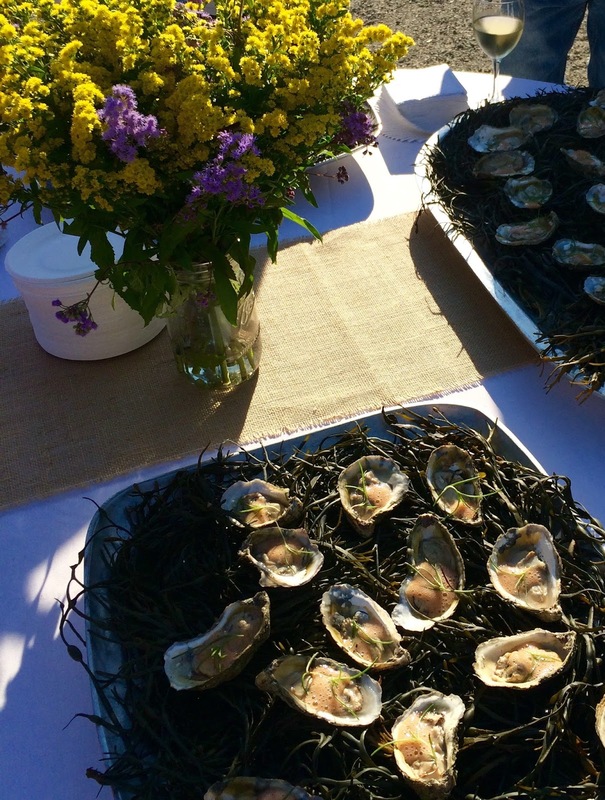 The location and chef are TBD right now, but you know Triad Local First and the chefs in the Triad will continue to raise the bar for this outstanding event. I was so proud to be part of it. And I'm still full.